The Casinos Austria Poker Tour (CAPT) will hit the ski resort town of Seefeld in February and online poker players are being offered the chance to win a seat into its main event for as little as $2.20. 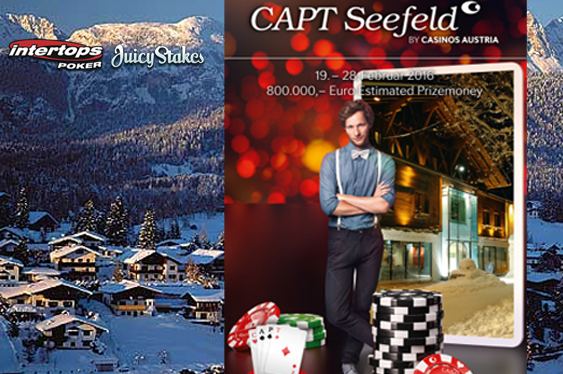 The Seefeld stop of the CAPT will take place from February 18 to 28 with an estimated $864,000 up for grabs and Intertops Poker and Juicy Stakes are running a special three-tier satellite competition that will hand out one prize package into the main event valued at $3,200. The winner of the sites’ special competition will bag their $2,335 buy-in alongside four nights at a premium hotel and $500 for travel expenses. Step-one satellite competitions featuring a buy-in of $2.20 begin at Juicy Stakes and Intertops Poker on Wednesday. The winners of these competitions will receive tickets into $11 buy-in step-two competitions where seats into a December 20 final will be awarded. The subsequent top-placed competitor in this final will then take home the CAPT Seefeld prize package worth $3,200 and get to compete in Austria come February. Juicy Stakes and Intertops Poker will send online poker player to Austria in February. “It would be great to see another player go all the way,” read a statement from Intertops Poker. “Just last week, one of our players won the TKPT event in St Maartens [for] over $30,000 in prize money and he got there by winning a $2 buy-in step-one tournament and then winning his way all the way to the main event.